Misaligned mirrors are being blamed for a fire that broke out yesterday at the world’s largest solar power plant, leaving the high-tech facility crippled for the time being. It sounds like the plant’s workers suffered through a real hellscape, too. A small fire was reported yesterday morning at the Ivanpah Solar Electric Generating System (ISEGS) in California, forcing a temporary shutdown of the facility. It’s now running at a third of its capacity (a second tower is down due to scheduled maintenance), and it’s not immediately clear when the damaged tower will restart. It’s also unclear how the incident will impact California’s electricity supply. NOAA’s vandalism of ERSSTv3b2 (good) to ERSSTv4 (corrupted) hinges on a single point. H/T to Paul Vaughan for pointing to a series of comments by Bill Illis on wuwt, which describe and differentiate between the under-ice salt induced sinking which forms Arctic deep water and the Greenland-melt surface waters which flow into the Gulf Stream. These were in response to an alarmist paper which claims that increased freshwater flux could weaken the AMOC and thus global circulation. And the salinity in the ocean in the area in question has changed by exactly ZERO. The paper doesn’t address this issue one iota. The AMOC starts under the sea ice throughout the entire Arctic Ocean basin. Somehow climate scientists have convinced themselves that the deep water formation of the AMOC is next to Greenland. There is no way to correct them because they don’t actually care what the facts are, just what gets them published in the climate theology field. The sea surface temperatures in the Norwegian Sea range from +2.0C to +10.0C. The Arctic Bottom Water is -0.5C to -1.0C and is 3000 metres deeper. it has nothing to do with the Nowegian Sea. 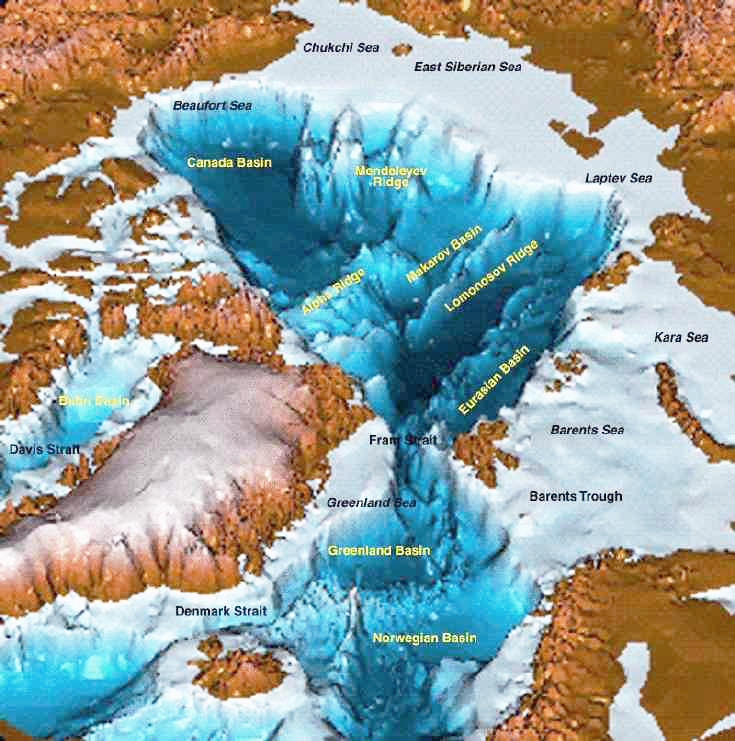 The Arctic Bottom Water overflows the canyons and chokepoints out of the Arctic Ocean basin, particularly the Fram Strait canyon, the Denmark Strait and the Greenland-Scotland Ridge. The atmosphere, why the dispute over what causes what is? A few days ago Hockey Schtick brought up Feynman deriving the basic atmospheric gas and temperature profile without mentioning radiation and showing that classical physics fails, quantum mechanics is required. From Fenyman lectures VOL 1, Chapter 40, showing the contradiction between classic physics and reality, annotated by author. This is one and the same as the ultra-violet catastrophe matter, both needing a quantum physics jump. Two explanations for one thing might be the food of cats or thought experiments but is not valid in the real world, one planet, although sometimes looking at the state of people I wonder. Rial (2012) drew my attention to a fundamental correction that’s underway in oceanography (more notes forthcoming on this later) …. Lozier, Susan (2010). Deconstructing the conveyor belt. Science 328, 1507-1511. Though appealing in its simplicity, the ocean conveyor-belt paradigm has lost luster over the years […] the ocean’s eddy field, unaccounted for just decades ago […] figures prominently in the dismantling of the conveyor-belt paradigm. Another player in this dismantling is the ocean’s wind field. The traditional assignation of surface ocean gyres to wind-forcing and overturning to buoyancy forcing has ignored the vital impact of winds on overturning pathways and mechanics. […] the conveyor-belt model no longer serves the community well […] because it ignores crucial structure and mechanics of the ocean’s intricate global overturning. 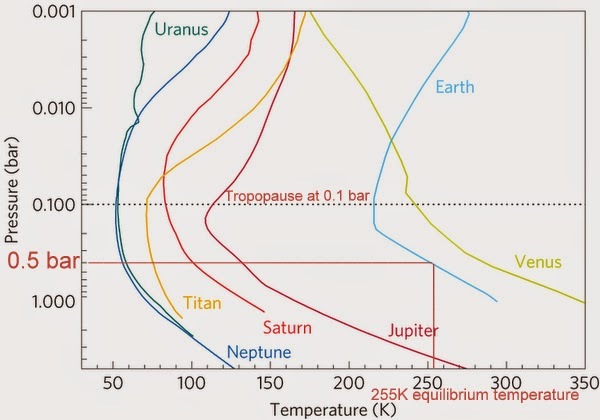 Over at the Hockey Schtick, Michael has an interesting new angle on determining planetary surface temperature from pressure and gravity – a subject covered extensively here at the Talkshop over the last three years. Here’s an extract. Of particular interest here is his new method of using the centre of mass of the atmosphere as a reference point. Head on over to read the full post. We are determining the temperature gradient within the mass of the atmosphere and the equilibrium temperature is thus at the center of mass. The “effective radiating level” or ERL of planetary atmospheres is located at the approximate center of mass of the atmosphere where the temperature is equal to the equilibrium temperature with the Sun. The equilibrium temperature of Earth with the Sun is commonly assumed to be 255K or -18C as calculated here. As a rough approximation, this height is where the pressure is ~50% of the surface pressure. It is also located at the approximate half-point of the troposphere temperature profile set by the adiabatic lapse rate, since to conserve energy in the troposphere, the increase in temperature from the ERL to the surface is offset by the temperature decrease from the ERL to the tropopause. Fig 1. From Robinson & Catling, Nature, 2014 with added notations in red showing at the center of mass of Earth’s atmosphere at ~0.5 bar the temperature is ~255K, which is equal to the equilibrium temperature with the Sun. Robinson & Catling also demonstrated that the height of the tropopause is at 0.1 bar for all the planets in our solar system with thick atmospheres, as also shown by this figure, and that convection dominates over radiative-convective equilibrium in the troposphere to produce the troposphere lapse rates of each of these planets as shown above. R&C also show the lapse rates of each of these planets are remarkably similar despite very large differences in greenhouse gas composition and equilibrium temperatures with the Sun, once again proving pressure, not radiative forcing from greenhouse gases, determines tropospheric temperatures. For Earth, surface pressure is 1 bar, so the ERL is located where the pressure ~0.5 bar, which is near the middle of the ~10 km high troposphere at ~5km. The average lapse rate on Earth is 6.5 km, intermediate between the 10C/km dry adiabatic lapse rate and the 5C/km wet adiabatic lapse rate, since the atmosphere on average is intermediate between dry and saturated with water vapor. which is the same as determined by satellite observations and is ~33C above the equilibrium temperature with the Sun. Thus, we have determined the entire 33C greenhouse effect, the surface temperature, and the temperature of the troposphere at any height, entirely on the basis of the 1st law of thermodynamics and ideal gas law, without use of radiative forcing from greenhouse gases, nor the concentrations of greenhouse gases, nor the emission/absorption spectra of greenhouse gases at any point in this derivation, demonstrating that the entire 33C greenhouse effect is dependent upon atmospheric mass/pressure/gravity, rather than radiative forcing from greenhouse gases.